Paul Jackson Pollock widely known as Jackson Pollock was an American painter who was born on 28 January 1912 in Cody, Wyoming, United States and died on 11 August 1956 in Springs, New York, United States. 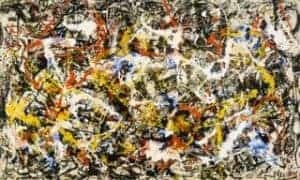 This article contains 15 most famous Jackson Pollock paintings. Read What is Abstract Expressionism? Gestural abstraction is clearly evident in Pollock’s works which feature vigorous and spontaneous movement through seemingly chaotic marks. The works were created with intention, but the effect is that of random impulse. Pollock let his moods determine the colour and the direction and location of paint that he splattered on a canvas on the ground. It may looks as though he merely stepped back and threw paint at the canvas, but every movement of the can or brush was done with purpose. 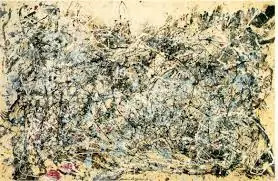 Convergence is a painting produced by Jackson Pollock in 1952. This represents earlier works of abstract expressionism and considered as one of the best bravest action paintings. This painting can be viewed at Albright-Knox Art Gallery, Buffalo, New York. 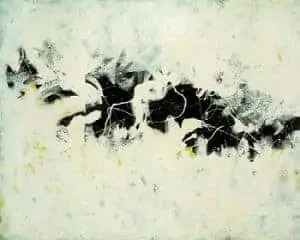 Convergence is a huge painting (241.9 x 399.1 cm) – regarded as one of the most famous paintings of Jackson Pollock and must be seen in person to acknowledge it’s grandeur. The painting was done during the Cold War, a period of crisis of war and it’s aftermath among the people. Abstract Expressionism provided a way for artists of all types to deliver feelings and ideas without the worry of public scrutiny of those thoughts. Of course, the public was reticent to accept their works as art, but that did not impede the movement’s freedom of expression. One: Number 31, 1950 is a painting produced by Jackson Pollock in 1950. In the summer and autumn of 1950, the artist produced three wall size paintings which included this one too. The dimension of this painting are 269.5 x 530.8 cm. This is one of the most famous Jackson Pollock paintings. 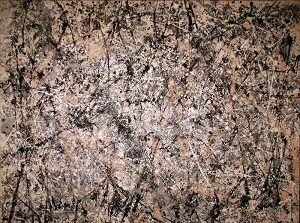 Shimmering Substance is a painting produced by Jackson Pollock in 1946. 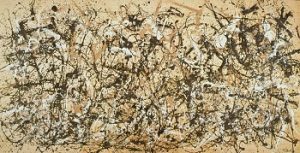 This painting is Jackson Pollock’s first completely non-representational works of the abstract art. The dimension of this painting are 76.3 x 61.6 cm. Mural on Indian Red Ground is a painting produced by Jackson Pollock in 1950. 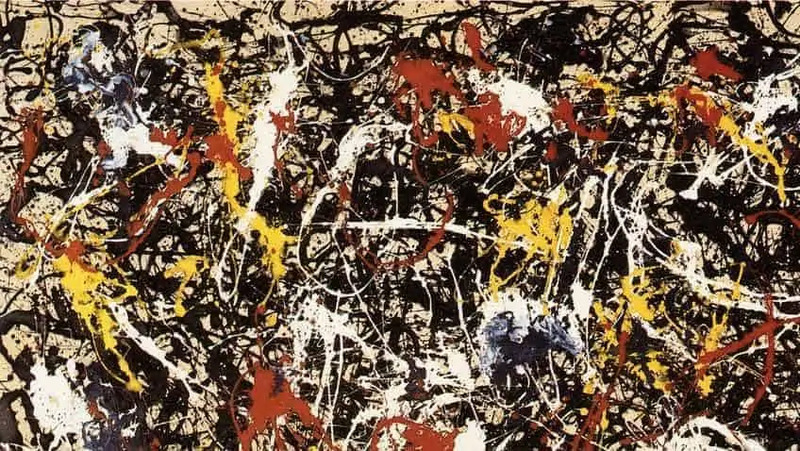 This painting is valued at about $250 million and is considered one of Pollock’s greatest works. 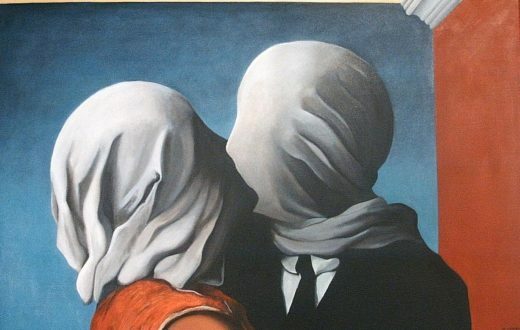 This painting can be viewed at Tehran Museum of Contemporary Art, Tehran. No. 5, 1948 is a painting produced by Jackson Pollock in 1948. The artist was known for his contributions to the abstract expressionist movement. The dimension of this painting are 2.4 m × 1.2 m.
Number 1 (Lavender Mist) is a painting produced by Jackson Pollock in 1950. In this painting, the artist used drip painting technique. This painting can be viewed at National Gallery of Art East Building. 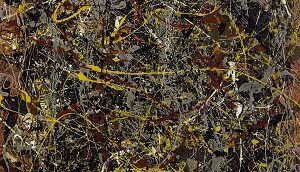 Number 11, 1952 is a painting produced by Jackson Pollock. 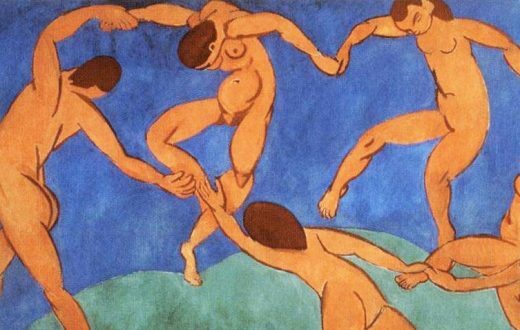 This painting is also known by the name as Blue poles. It was Pollock choice not to assign names to his works, but rather numbers. This painting can be viewed at National Gallery of Australia, Canberra. 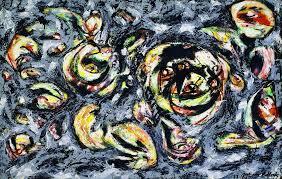 The Deep is a painting produced by Jackson Pollock in 1953. 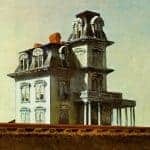 Many interpretation of this paintings means deep and profound void or hole, a viscous cut or dying man, hence the name The Deep. This painting can be viewed at Centre Georges Pompidou, Paris, France. Autumn Rhythm is a painting produced by Jackson Pollock in 1950. 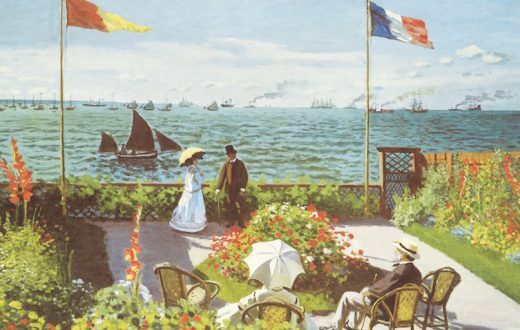 The original title given to this painting was Number 30 but it was changed later. The dimension of this painting are 266.7 x 525.8 cm. 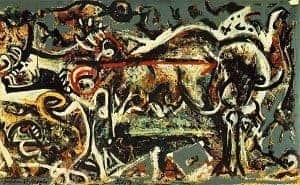 The She-Wolf is a painting produced by Jackson Pollock in 1943. This painting was featured in Pollock’s first solo exhibition at an Art of This Century gallery in New York in 1943. The dimension of this painting is 106.4 x 170.2 cm. 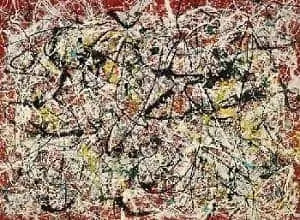 Number 1A, 1948 is a painting produced by Jackson Pollock in 1948. Jackson’s wife commented on numbering paintings “Numbers are neutral. They make people look at a painting for what it is—pure painting”. The dimension of this painting is 172.7 x 264.2 cm. 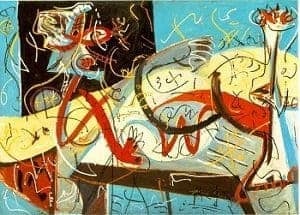 Stenographic Figure is a painting produced by Jackson Pollock in 1942. This painting style is bright and airy which reflect perhaps the artist new relationship with painter Lee Krasner. The dimension of this painting is 101.6 x 142.2 cm. 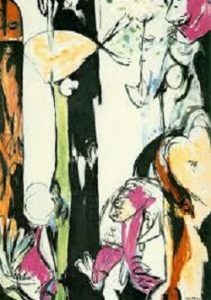 Easter and the Totem is a painting produced by Jackson Pollock in 1953. The totemic forms at the left and right in this painting reflect his renewed interest in using a brush to paint quasi-figurative images. The dimension of this painting are 208.6 x 147.3 cm. 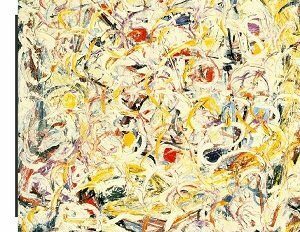 Summertime: Number 9A is a painting produced by Jackson Pollock in 1948. The rhythms in this painting reflect his belief that ‘The modern artist is working and expressing an inner world. The dimension of this painting is 848 x 5550 mm. One of the many famous Jackson Pollock paintings is – Ocean Greyness. 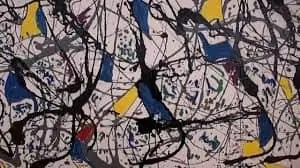 It is a painting produced by Jackson Pollock in 1953. Vogue magazine published fashion photographs by Cecil Beaton of models posing in front of Pollock’s drip paintings in 1951. The dimension of this painting is 146.7 x 229 cm.